For 4 hour charters, we have two convenient time slots to choose from: 10am-2pm or 3pm-7pm. 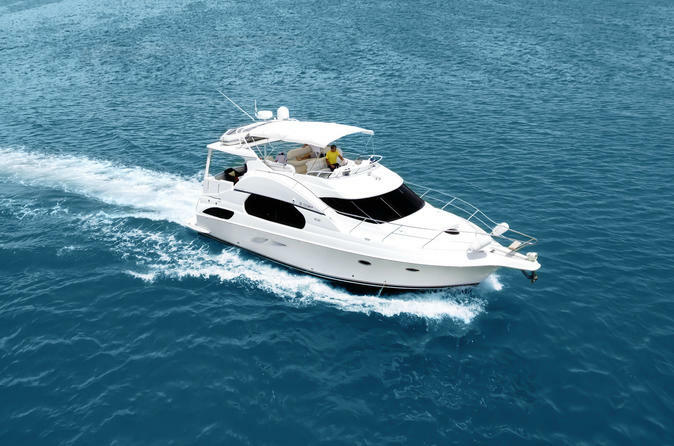 For 8 hour charters, you're more than welcome to choose an 8 hour period that works for you. For groups of 6 or less, we'll meet at our marina located at 10800 Collins Ave, Miami Beach, FL 33154. For groups over 6 (max 12) we'll meet at Duffy's Sports Bar located at 3969 NE 163rd St, North Miami Beach, FL 33160. You're more than welcome to bring food and beverages, please keep glass to a minimum (breaks) and don't bring red wine (stains). We have a grill and full kitchen to prepare meals. If you're more adventurous, we also have a private chef that specializes in Italian and Mediterranean cuisine available for an additional fee. We'll have basic snacks, soft drinks and ice available. Rest assured, you're in good hands. Our captain has a 100 ton license and a decade of experience navigating international open waters. We're commercially insured and the crew is CPR certified. Depending on the groups preferences, we can stop to enjoy some time in the water. We have plenty of inflatables, snorkeling gear etc. Absolutely, please bring your favorite playlist! You’ll be able to play music through either an AUX cord or Bluetooth connection. You’re more than welcome to bring anything you want, we have a full kitchen and outdoor grill for you to use. We have plenty of open air public parking at our marina. Absolutely, the crew works solely on gratuity. How many people can we fit on your yacht? We can legally only accommodate up to 12 guests. We can pick you up from almost anywhere, depending on if there’s an available dock. Keep in mind that some marinas charge a fee to pick up customers. The clock starts when we leave our home marina, you can always buy more time to offset the convenience of a pickup. Although yachts are notoriously not geared towards people with handicaps, we’d be more than happy to accommodate you in a judgement free zone. We want everyone to have a good time and we believe a handicap shouldn't get in the way of enjoying time on the water.